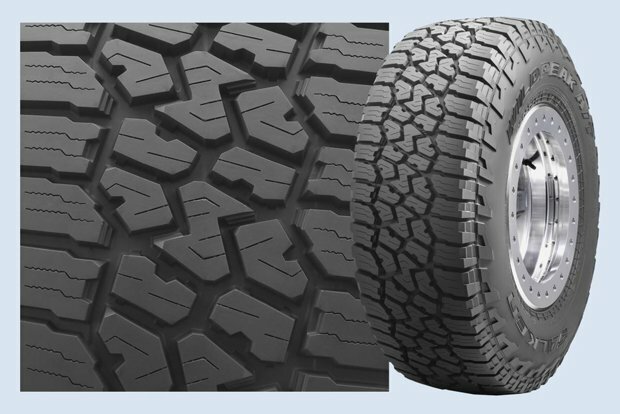 Going to be getting new tires for the Suburban soon and these popped up on my radar as a possible alternative to the old standby BFG AT KO2's I was planning on getting. They enjoy a pretty decent price premium over the BFGs, depending on where you get them (they're around $25 - $30/tire less than the BFGs.) They seem to have a nice semi-aggressive design with lots of voids (like the BFG) and they carry the "severe weather" snowflake/mountain rating. I don't mind paying the price for BFGs if they're legitimately going to be better but I thought I'd just throw this out there to see if anyone on the board has any 'real world' experience with them. For some bizarre reason our local Discount Tire franchises don't carry these here (because, really, who would want a snow-rated AT tire in Colorado anyway, right? ) but there are other tire retailers that do. How are Falken tires generally in terms of quality? I always got the impression they were "second tier" in terms of quality but that may not be right. I have the last wildpeaks on mine... I really, really like them, considering they were like 160 or something each, and then the 4th one was free. However, now that they have 20k miles on them, I just noticed that the tread blocks have different depths around the tire, and so when they wear, I will lose some of them. Kind of disappointed in that, but for the price, they've done well, and the compound and design has been good, stayed in balance and has had decent grip in snow, mud and other stuff I have thrown at them for being an AT. I figure they will last another 10k miles before they won't be top shape for snow and mud off road (In a non-off road setting would probably last to 50-60k miles), and I'll go with something else. Definitely going to put the above on my list. Also, these looks like the tread blocks go all the way down, so that's a non-issue, if the price difference is big, I wouldn't hesitate. OK just called Discount. They can order them, cost is $163 each which is $47/tire less than the AT KO. I guess they're a new tire. I think I'll give them a shot. Since I don't do much "off roading" in the 'Burb I'm hoping they'll be the kind of tire I need. I'll let the board know how I like them once I've had them for a while. I got a set of these two weeks ago. So far so good but I'll let you know as I go. I have only the Cooper S/T Maxx to compare them to. Please let us know how they compare to the st/Maxx. I am thinking about buying the Coopers. Just put a set on my rig. Only have highway miles on them so far. But they ride nice and quiet, much quieter than I thought they'd be. They were somewhat of a pain to balance but they were doable. I have the last wildpeaks on mine... I really, really like them, considering they were like 160 or something each, and then the 4th one was free. However, now that they have 20k miles on them, I just noticed that the tread blocks have different depths around the tire, and so when they wear, I will lose some of them. Couldn't a couple of hours with a tire grooving tool fix that? Yep, been debating that, however with towing, don't really want to mess with that and effect the weight capacity of the tire. I had quite a disappointing experience with the Falken Wild Peak A/T3W two days ago. It is important to disclose that in addition to changing from the S/T Maxx to the Wild Peak A/T3W I also changed from a LT255/75R17 to a LT285/70R17 therefore I cannot be sure how much of what I experienced was due to that and how much was due to the tires alone. Please pardon the length of this narrative; it is not an interesting story and I do not relate it as one, but I could not think of another way to present the experience I had without additional bias. I headed out onto a local network of primitive service roads in the southern Washington Cascades which include good gravel, bare dirt, and rocks. I aired-down to about 20 psi, my customary off-pavement pressure when I know I'll be out there a while. While some of these roads and tracks I was on for the first time I have driven enough similar roads in the 30,000 miles I have on the Coopers that I feel fairly confident in an imagined comparison. This was a dry day following a few days of rain so the ground was quite wet in places, but there was only a little legitimate mud. Primarily it was leaf litter over wet high-humus soil and rounded rocks. I had to use 4WD in multiple locations that surprised me. At first I gave the Falkens the benefit of the doubt and figured I was on a particularly slippery rock or the leaves might be more slippery than I thought, but as it happened again, then again, I started to worry. When I spotted a steep dirt track heading uphill from one of the roads I decided to test the combined limit of my abilities and my modestly equipped 4Runner. I started in 2WD and slipped almost at once, which wouldn't have surprised me with either tires in this spot. The trail threaded between trees with only a few inches of clearance so I put it in 4 Lo for control anyway. I still fought slipping and experienced more lateral slipping than I anticipated. The track became increasingly steep and even with the center differential lock I was unable to make forward progress. I carefully got out and observed the situation. The tires, rear especially, were thoroughly packed with dirt. The ground was wet but this was not slick clay mud. The narrowness of this track did not lend itself to the skinny-pedal method of clearing the treads so I accepted my defeat and backed out gingerly, feeling certain I would have made it farther with the Coopers. I continued on the mild roads in 2WD for a while until I had a "last straw" kind of experience. I drove down a gently sloping dirt road until it came to a dead end, then attempted to back up to the turn-around I had spotted just a little before. I couldn't back up this gentle slope in 2WD! I tried several times as I was getting a bit ticked off and felt rather determined to make it up in 2WD. After I gave up and backed in 4WD I got out and walked the shallow ruts I had left in my earlier attempts. They were NOT slick, and barely more than damp. I could dance up and down them in the nearly lug-less shoes I was wearing with complete confidence. The tires on examination were again fully packed with dirt. I drove through some watery mud on my way out and didn't have any problem, and the tires did well enough on a steep and somewhat loose gravel hill, but I am still rather crestfallen about my purchase of the A/T3W's at this point. I still haven't had the tires in snow, which is the reason I bought them after getting stuck with the Coopers several times last season. I hoped this would be one tire to do everything I need in all seasons but there is a lot of wet dirt around here and I am having a hard time imagining being happy (and safe!) on these tires in a lot of the places I want to go. I wonder if the wider 285 footprint is contributing to the traction failures I experienced? Seeing how badly the tires were packed with dirt I don't know that a 265 would have made any difference in "digging down." Also despite the A/T3W being described as "amazingly quiet" by multiple people I do not find it quantitatively quieter than the S/T Maxx. Perhaps it is a little more quiet but also a bit less smooth? Are larger tires generally less smooth running than smaller ones? In any case both are quite quiet, but the S/T Maxx was more quiet than I expected whereas the A/T3W, while similar, is less quiet than I thought it might be from the reports. Neither will be mistaken for a P-metric touring tire. I am unsure what I will do about this. My comment to geronracing about "fixing" the old Wild Peak with a grooving tool seems almost prophetic now as I seriously but with trepidation ponder the effect of grooving out the shoulder blocks on the A/T3W to increase the void ratio, much as the S/T Maxx shoulder blocks are wider spaced. I really don't want to have to do that as the 55,000 mile tread-life warranty was a significant consideration in my purchase decision, but selling these tires would probably cost me more than if they wear out early. Considering that my most recent impression of the S/T Maxx is with no more than two thirds of their original tread depth whereas the A/T3W had full tread depth (I have only two thousand miles on them) I am frankly surprised that the Falken seems to perform as poorly as it does. I never thought my use justified a Mud Terrain tire but now I am at least curious about those as well, if they outperform the S/T Maxx by as much or more than it apparently does the A/T3W. Are there any tires on the market that work well in wet dirt, snow of all kinds, rainy highways, and have a strong sidewall? The closest thing I can find may be the DuraTrac but the reports of weak sidewalls I have repeatedly found are deeply concerning given my habit of driving roads littered with logging slash. I'm not sure anything other than a MT would have done any better. Wet dirt that packs in between the treads of a tire basically turns that tire into a racing slick. I presume a lot of people in the wetter parts of the US run MT's for this very reason. Well the tires are on, just in time for our trip to AZ next week. I'll report back on how well they do on the highway and the mild dirt roads I expect to be using them on. I think you made a good choice. As soon as Ford gets some decent rebates on the new Super dutys I plan on getting a set of these. I do not know how you classify the Cooper S/T Maxx but I am confident they would have done better. As stated I have 30,000 miles on those so I have a pretty good feel for how they behave. I have seen the S/T Maxx described as a "hybrid AT/MT" and perhaps it is; if so I didn't give its "MT" nature enough credit. As acknowledged I don't know how the change in size is affecting this. I hope your new tires serve you well.